Description Generations of New Zealanders responded to pioneering broadcaster Aunt Daisy's nine o'clock radio catchcry, 'Good morning, everybody'. While her nationwide broadcasts ended more than 40 years ago, her legacy lives on. The Aunt Daisy Cookbook was first published in 1968 and reprinted more than 20 times since. Her basic, tried-and-true recipes have been used by New Zealanders for many years. 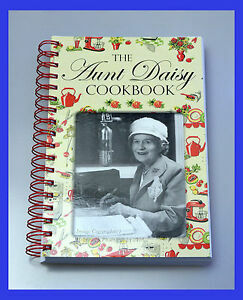 The Aunt Daisy Cookbook is an iconic book from an iconic Kiwi and w, in 2009, has the added stalgic element. All royalties from the sale of this book will go to fund medical research in New Zealand. Author Biography Barbara Basham was the daughter of Aunt Daisy. She served as a nurse in Egypt during World War II before establishing a career in public radio that spanned more than 30 years. Barbara was awarded an MBE for her services to Broadcasting and Community in 1981. Barbara compiled The Aunt Daisy Cookbook from Aunt Daisy's recipes and it has proved to be one of New Zealand's all-time bestselling cookery books. Old time recipes now readily available to everyone.